Characteristics: an early Swedish variety which is resistant to frost and quite resistant to diseases. The tree starts to bear fruit early and it yields regularly every year. 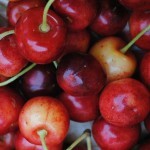 Fruit: medium-sized (weight: 4.5-5.5 g), heart-shaped. 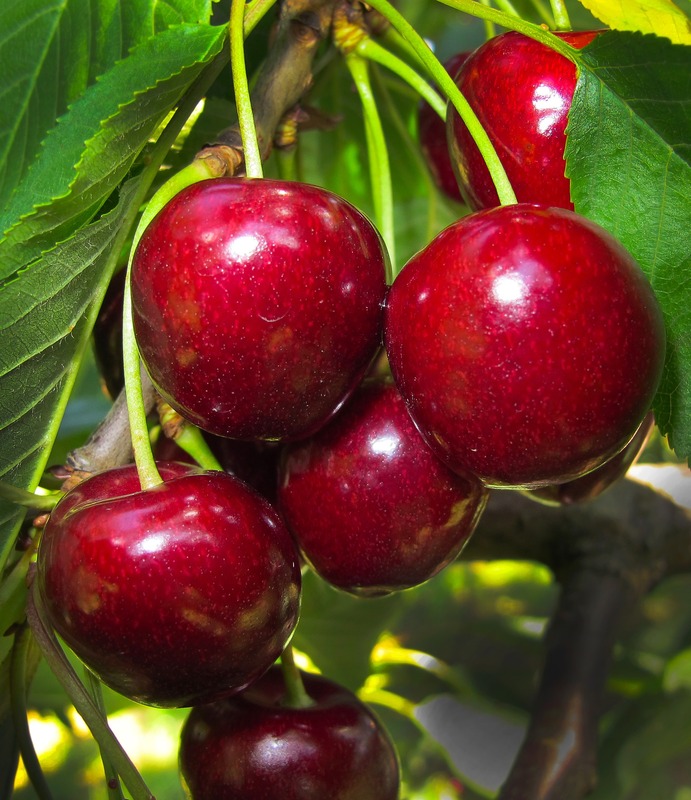 The skin is dark red (when fully ripe it turns almost black), resistant to cracking. The flesh is red, slightly acid, tasty, medium-soft. 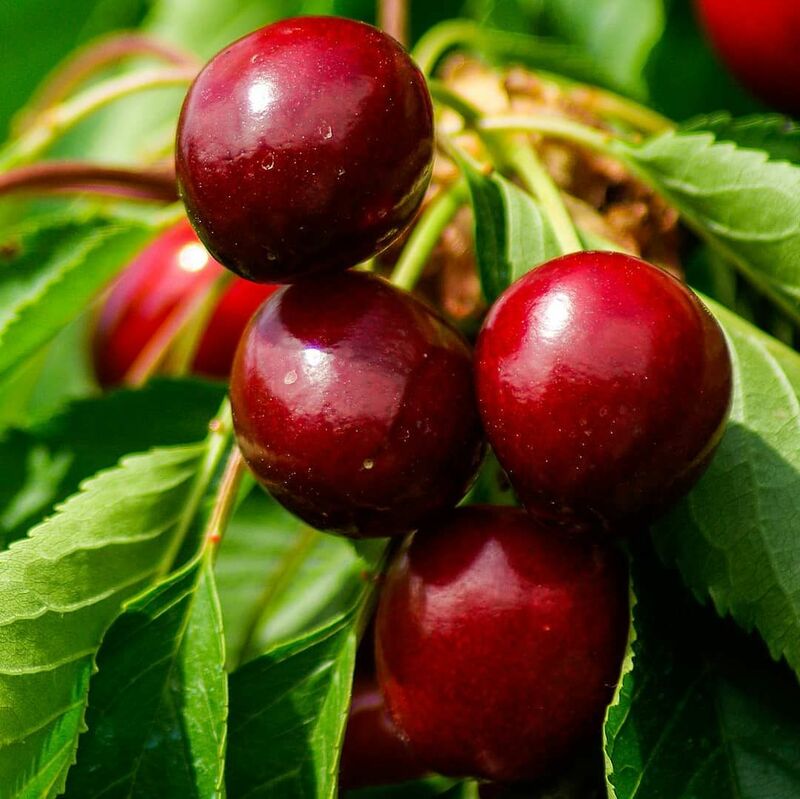 Characteristics: one of the most attractive early-ripening sweet cherry varieties which comes from France. It is resistant to most sweet cherry diseases and has exceptionally tasty, large, sweet, dark fruit. The tree starts to bear fruit quite early (4-5 years after planting) and it yields abundantly and regularly every year. Fruit: large to extra large (weight: 6-7 g), heart-shaped. 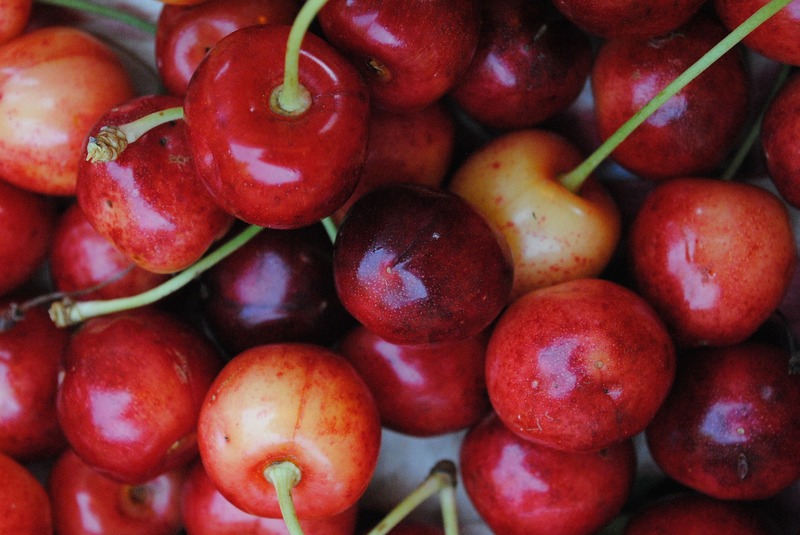 The skin is crimson-red (very dark when fully ripe). 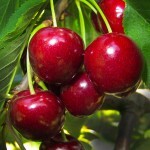 The flesh is dark red, juicy, sweet, aromatic, extremely tasty. 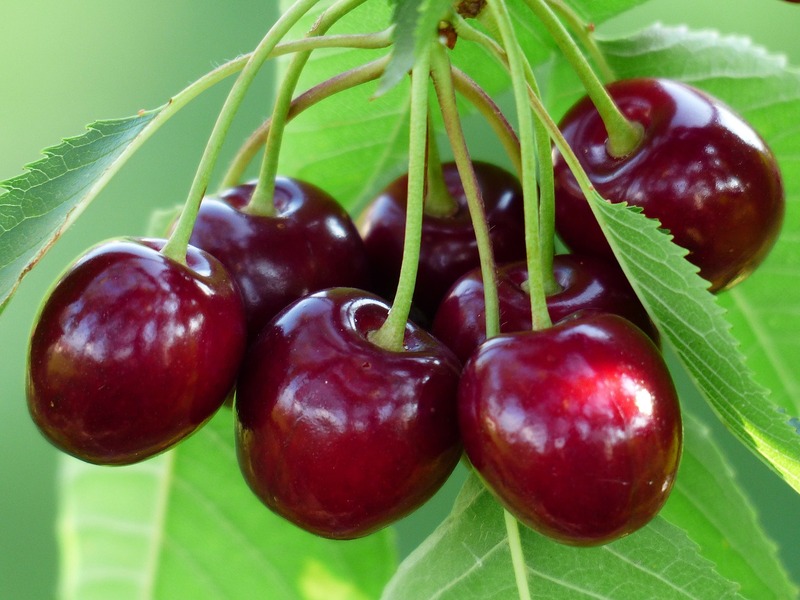 Characteristics: a dessert variety which comes from Canada and is quite resistant to frost. 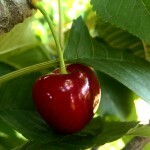 The tree starts to bear fruit early (even 2-3 years after planting) and it yields abundantly and regularly every year. Fruit: large to extra large (weight: 7.5-9 g), heart-shaped. The skin is yellow almost fully covered with a bright orangey-red blush. The flesh is light yellow, firm, hard, vinous, refreshing, very tasty. Characteristics: a dessert variety from Canada which is also good for canning. It is resistant to frost and diseases. The tree starts to bear fruit quite early and it yields abundantly and regularly every year. It is also attractive due to its high resistance to cracking in a rainy weather. Fruit: large (weight: 7.5 g), wide, heart-shaped. The skin is dark red (almost black when fully ripe). The flesh is dark red, hard, with a little bitterness. Characteristics: a Canadian variety resistant to frost, however, susceptible to diseases and cracking. The tree starts to bear fruit early and it yields abundantly and regularly every year. Fruit: large (weight: 6.5-8 g), round, kidney-shaped. The skin is dark red (black when fully ripe), shiny. The flesh is light red, very firm, very hard, sweet, aromatic, exceptionally tasty. Characteristics: an old German dessert variety which is very resistant to frost and diseases. It is especially attractive as bright golden fruit is less interesting to birds than red fruit, which means more for you to harvest. The tree starts to bear fruit very early and it yields abundantly and regularly every year. 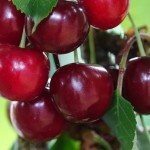 Fruit: medium-sized (weight: 5-6 g), heart-shaped. The skin is pale yellow to yellow brown, shiny and slightly translucent. 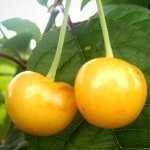 The flesh is yellowish-white, hard, very tasty. Characteristics: a dessert variety from Canada which is also god for canning. It is resistant to frost and diseases. The tree starts to bear fruit early and it yields abundantly and regularly every year. Fruit: large (weight: 9-11 g), wide, heart-shaped, visibly flattened. The skin is dark red. The flesh is creamy, hard, juicy, very tasty. The fruit is resistant to cracking. 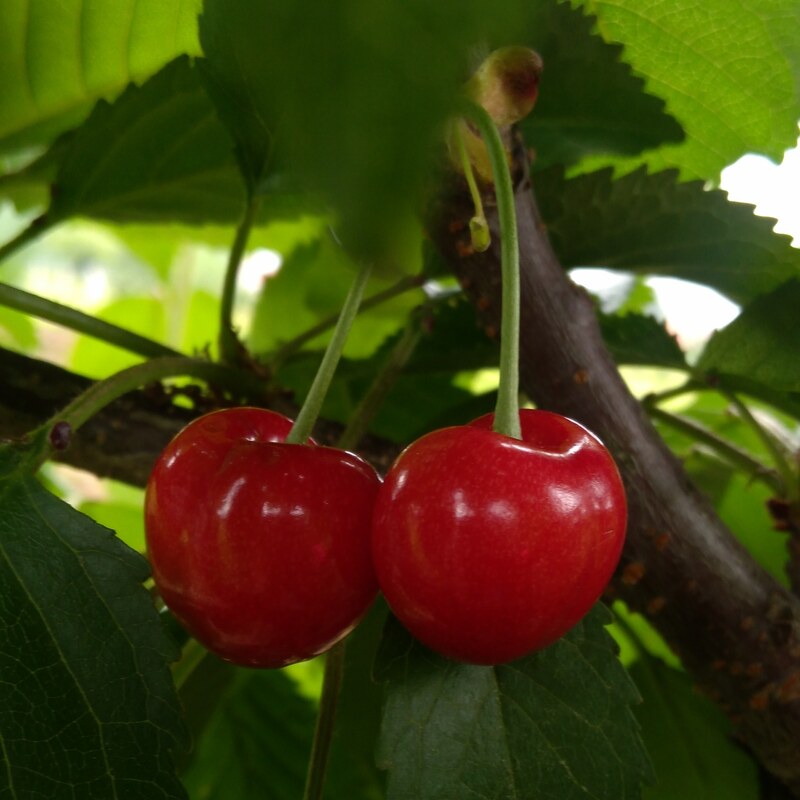 Characteristics: a late-ripening variety from Germany resistant to frost and bacterial diseases. However, due to its susceptibility to cracking it is not very suitable for places with heavy rainfalls. The tree starts to bear fruit early and it yields abundantly and regularly every year. Fruit: large (weight: 6-8 g), heart-shaped, regular. The skin is light yellow almost fully covered by a dark red blush. The flesh is light yellow, hard, slightly aromatic, sweet, very tasty. Characteristics: a late-ripening variety from Canada. 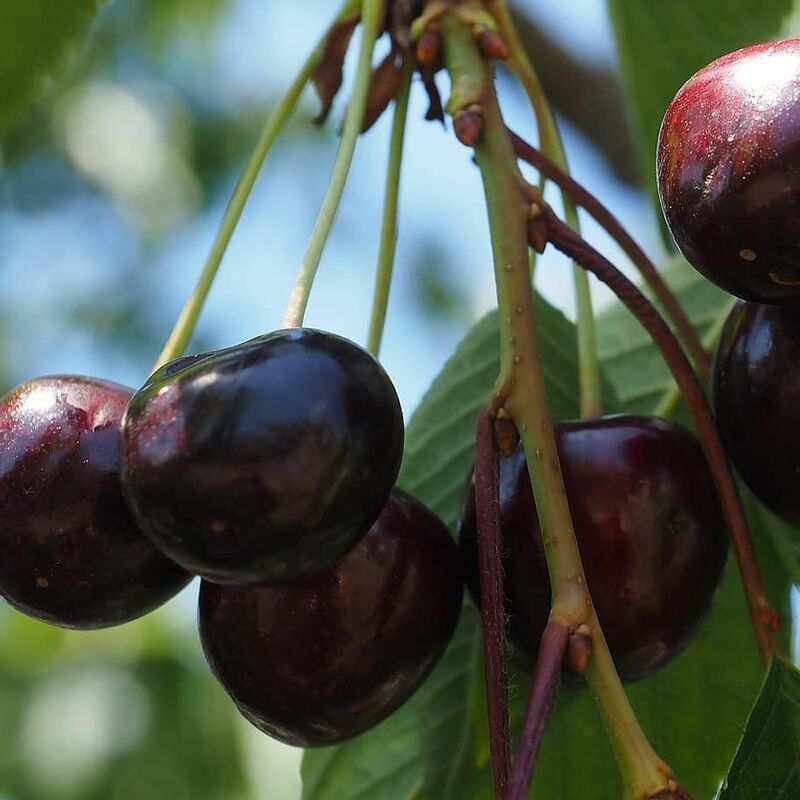 It is very interesting due to its weak and slow growth, it is the first naturally dwarfing variety which has revolutionised Polish orchards in the last few years. 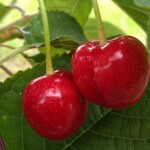 Thanks to its weak growth and compact crown it is ideal for small gardens and intensive orchards. The tree starts to bear fruit early and it yields abundantly and regularly every year. Besides, it has crack-resistant and exceptionally tasty fruit. Fruit: large to extra large (weight: 8-10 g), heart-shaped. 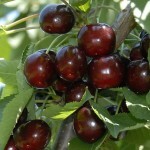 The skin is dark red (black when fully ripe), shiny. The flesh is dark red, firm, hard, juicy, sweet, very tasty. 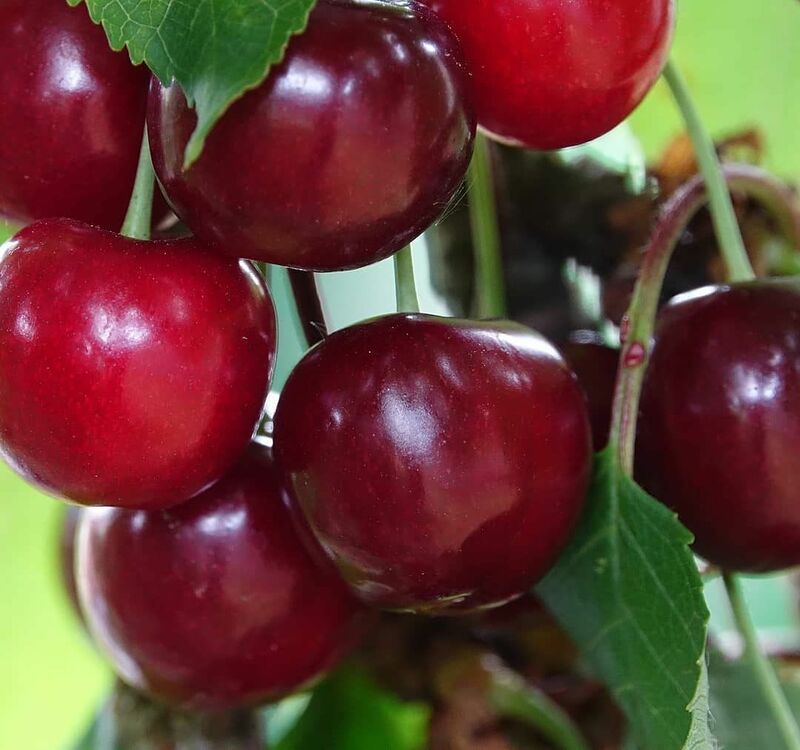 Characteristics: a very old, late-ripening variety which probably comes from Germany, it was named after the place where it was first found Hedelfingen near Stuttgart. The tree starts to bear fruit quite early and it yields abundantly and regularly every year. 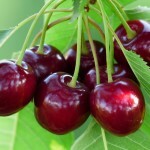 Besides, it is a very interesting variety as it is a very good pollinator for other sweet cherries. Fruit: large (weight: 7-8.5 g), elongated, egg-shaped. The skin is dark red (black when fully ripe), shiny. The flesh is dark red, firm, hard, juicy, sweet, very tasty. 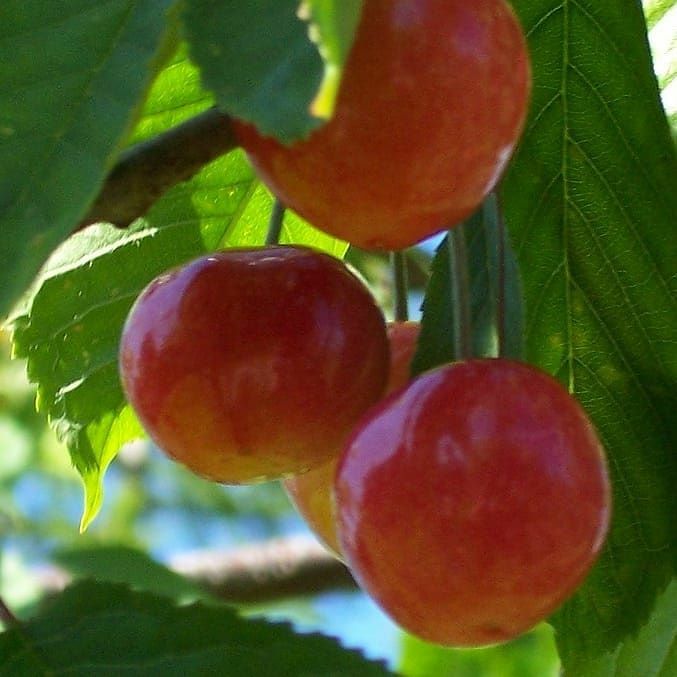 Characteristics: a dessert Czech variety, one of the most valuable late-ripening sweet cherry varieties, appreciated for its especially attractive fruit. The tree starts to bear fruit early (3-4 years after planting) and it yields abundantly and regularly every year. Fruit: large to extra large (weight: 8-10 g), heart-shaped, elongated. The skin is carmine red. The flesh is light red, firm, hard, aromatic, very tasty. The fruit is resistant to cracking. 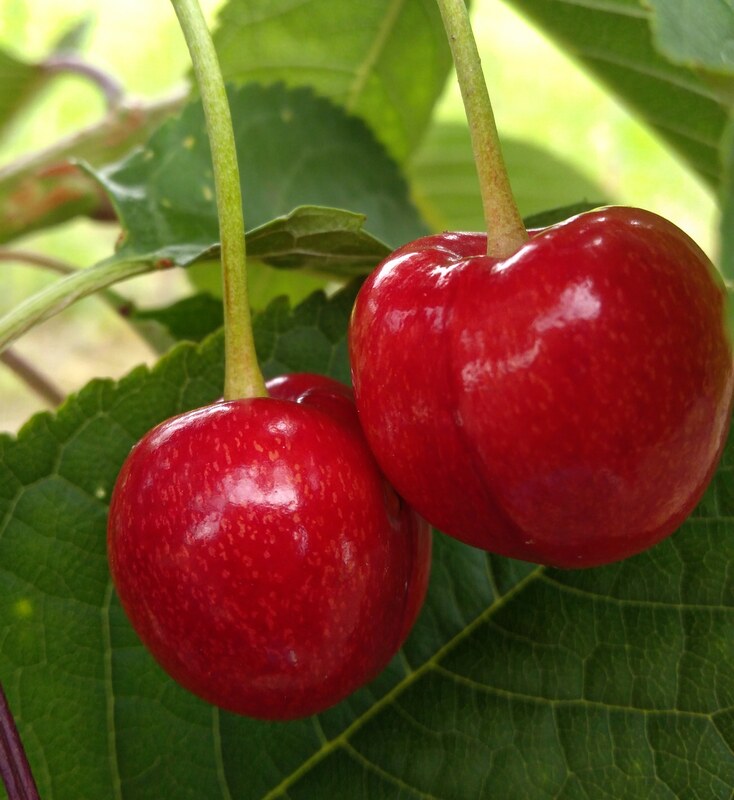 Characteristics: a German variety which earned a nickname ‘the Queen of Cherries’. The tree starts to bear fruit early and it yields abundantly and regularly every year. Fruit: large to extra large (weight: 9-10 g), heart-shaped, sometimes elongated. The skin is dark red, shiny. The flesh is light red, firm, hard, sweet, aromatic, very tasty. The fruit is resistant to cracking.